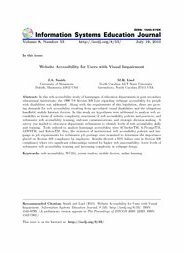 Abstract: In this web accessibility study of homepages of education departments in post secondary educational institutions, the 1998 US Section 508 Law regarding webpage accessibility for people with disabilities was addressed. Along with the requirements of this legislation, there are growing demands for web accessibility resulting from age-related visual disabilities and the ubiquitous handheld, mobile Internet devices. In this study six hypotheses were addressed to analyze web accessibility in terms of website complexity, enactment of web accessibility policies and practices, and webmaster web accessibility training, end-user communications, and strategic decision-making. A survey was mailed to education department webmasters to identify levels of web accessibility skills and training. Tools utilized to analyze homepage accessibility were ACheckerTM, A-PromptTM, JAWSTM, and KelvinTM. Also, the existence of institutional web accessibility policies and language in job requirements for webmaster job postings were examined to determine the importance placed on Section 508 compliance by employers. Results showed a 95% failure rate in Section 508 compliance where two significant relationships existed for higher web inaccessibility: lower levels of webmaster web accessibility training and increasing complexity in webpage design.